It’s really too hard to tell. Emotion tells me they should be retired, given everything they’ve meant to the program, both on and off the court. But I also believe that there should be a pretty firm criteria for retiring jerseys so that we don’t run out anytime soon. It still has to be a really special thing. The one thing I absolutely agree with is that it’s a package deal, both or neither. There’s no way to really get around that. Very interesting read, You make great points for retirement of jerseys, but again what is the criteria. I’ve never known myself except that it is and should remain high so as not to lessen those that hang there now. I feel in the end,and in my heart that both their numbers should hang in the rafters, because while you can measure facts, stats and compare all the numbers you want you can not measure heart, but if you could these two certainly would make that measure. There shouldn’t even be a second thought about this. 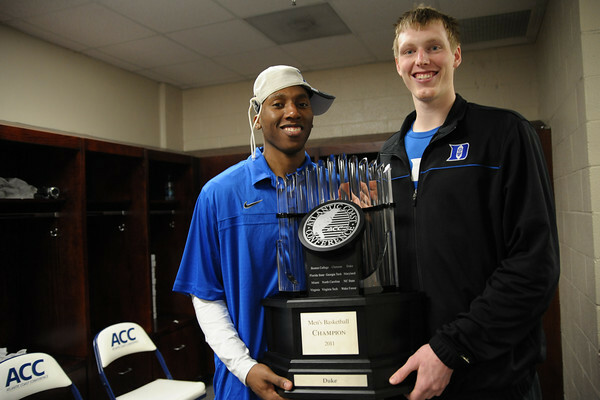 Singler a 4 year started 3 time acc tourney champion National champion and MOP of 2010 Tourney! avg double figures all 4 years! Top 10 all time on Duke scoring list. Came back when he could have be a lottery pick last year for his senior year which without a doubt got Smith to return. He’s jersey deserves to be retired. Nolan smith same thing minus MOP but was acc poy. He Carried Duke this year when Irving was out and singler struggled. Without Nolan this year would have be bad. Put they jerseys up there. Duke has retired 13 jerseys, listed to the side. To be eligible to receive this honor at Duke, a player must graduate from Duke University and also be recognized at the national level (such as be named National Player of the Year or Defensive Player of the Year, set an NCAA record, or be named as an All-American). Naming all of Kyle’s accomplishments shows the incredible effect he had on the Duke program during his four years. I like your thoughts, but I would question the absolutism of saying “don’t even give it a second thought.” I just don’t think it’s that easy, though, emotionally, as a Duke fan, I wish it were.